I don’t know about you, but the prospect of people not only claiming, but rejoicing in a society where people’s “fundamental moral principles differ” scares me. And yet sadly that is the very society we seem to live in. Let us for now dismiss all the other current issues and focus on the most important one at hand: the sanctity of life itself is being questioned, with no sense of distortion. The debate was called for by a multiple sclerosis patient Debby Purdy, opting for a change in law. The debate covers a wide array of thoughts circulating the topic of assisted suicide, such as: prosecutions of British citizens flying patients over the border to Switzerland to have assisted suicide done legally; the fact that suicide was officially legalized in 1961 but assisted suicide remained illegal; and the vague cut-off as to how vulnerable a patient has to be in order to allow assisted suicide (hours to live, days, weeks, months?). She claims that research supports this, and I cannot doubt that this is probably true. But I do not see how knowing you can die a peaceful death whenever you want gives you the ability to tolerate a treatment. Medical treatment is focussed on extending your life. You would more likely decide not to start or complete the treatment if you had the option of a way out. Death provides no reassurance to endure anything, it rather provides temptation to endure nothing; to escape everything. What Emily is stressing however is probably that legalized assisted suicide will give people a sense of autonomy, a sense of choice (does this ring a bell?). I am a firm believer in free choice, freedom of the human person and their ability to make decisions. But of course, if a man is intent on killing my mother, I WILL do whatever it takes to stop him, and will by no means hold myself back on the basis of “choice”. Looking at human experience, it is clear that we DO in fact have a common morality. In a liberal society, where we accept that people’s fundamental moral values differ, we should strive to ensure that people…can coexist without any of us forcing our moral values upon anyone else. So I would not enforce assisted death on them, but THEY would force me to endure a death that I find intolerable. Now there a several things wrong with her argument. First of all, a society founded on Liberalism, is generally characterized by equal rights and equal voice of all the people. A 19th century philosopher Thomas Green developed the term positive liberty on which many societies still stand. This form of liberty views society “as an organic whole in which all individuals have a duty to promote the common good”. I don’t know about you, but “relative morality”and the “common good” do not seem to be the same thing. Also, her argument which states by not legalizing assisted suicide the government imposes its morality on vulnerable patients is a counter-argument, for in saying that we should not impose morality on one another, she is herself imposing morality upon us (I will not even go into the absurdity that “life” has become a moral construct and not a right). What would be gained by legalizing assisted suicide for those patients would be a small amount of extra autonomy to choose the hour and the day in which they die. But is that sufficient justification to expose large numbers of vulnerable patients to increased risk? Can YOU lose your voice for a day? 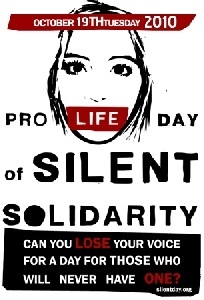 As many of you know, today is the annual “PRO LIFE DAY OF SILENT SOLIDARITY“. In respect for those who never had the chance to speak, pro-life campuses around Canada and around the globe will be witnesses to the injustice of abortion by being silent for the entire day and handing out flyers to those who ask why they are not speaking. Flyers can be downloaded here. Students are also asked to wear red arm bands or red tape around their mouths, in honour of the blood that has been shed by abortion. In the Lifesitenews article dedicated to this special day, it is stated that “Last year Stand True heard from participants that over 80 girls canceled their abortions on the day of the event due to the silent campaign”. This is amazing! I just wanted to say that there is so much we need to be thankful for. After all the events that are taking place at this very moment, such as 40 Days for Life in the US and in Canada, as well as the past trial of the Carleton and Queen students forcibly silenced , there is so much being done and said. At this very moment, crisis pregnancy centres are open and hoping for a new expecting mother who will walk in bravely and ask for help. I understand there is a great deal more that we can do to reach out to the students on our campus, and of course by no means can we just sit back and take a break, but we have certainly come a long way. The Pro-life stand is making its name known, and what we CAN certainly do is to make sure that this stand remains just and true. It cannot have any double standards and must be full of a care for all life.